The following special section features the latest U.S. Navy contract awards for shipbuilding, ship repair, electronics, communications and weapons. 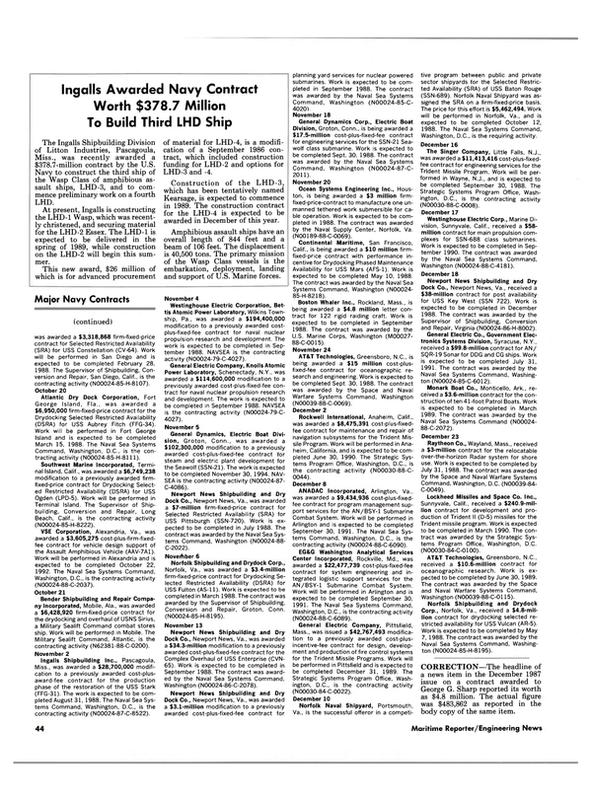 This special section covers major Navy contracts awarded between September 23 and December 23, 1987. For contract awards prior to these dates, refer to the Naval Technology & Shipbuilding Supplement in the December issue of MR/ EN. September 23 Raytheon Company, Wayland, Mass., was awarded a $11,370,000 m o d i f i c a t i o n to a previously awarded f i x e d - p r i c e c o n t r a c t for NATO Seasparrow missile s y s t em improvement for LHD-2 and NATO navies. Work will be p e r f o r m e d in Wayland and is e x p e c t e d to be c o m p l e t e d in October 1990. The Naval Sea Systems Command, Washington, D.C., is the c o n t r a c t i n g a c t i v i t y (N00024-87-C- 5609). AT&T Technologies Incorporated, G r e e n s b o r o , N.C.. was a w a r d e d a $33,576,770 cost-plus-fixed-fee contract f o r an enhanced modular signal processor f o r updating the Surveillance Towed Array Ship S y s t em (SURTASS) and t h e Submarine Advanced Combat S y s t em (SUBACS). Work will be p e r f o r m e d in Burlington, N.C. (3.4 p e r c e n t ) ; Greensboro, N.C. ( 4 2 . 7 percent); and Whippany, N.J. ( 5 3 . 9 percent) and is e x p e c t e d to be c o m p l e t e d in December 1988. The Naval Sea Systems Command, Washington, D.C., is t h e c o n t r a c t i n g a c t i v i ty ( N 0 0 0 2 4 - 8 1 - C - 7 3 1 8 ) . The Texas Parks and Wildlife Department, A u s t i n , Texas, was a w a r d e d a $5,080,000 g r a n t for r e s t o r a t i o n of t h e battleship Texas. The grant is Congressionally m a n d a t e d under Public Law 99-591. The work will be p e r f o r m e d in Austin and the funds will expire at t h e end of t h e current fiscal year. The Office of Naval Research, Washington, D.C., is t h e awarding a c t i v i ty ( N 0 0 0 1 4 - 8 7 - G - 0 0 5 1 ) . September 24 Sperry Corporation, Great Neck, N.Y., was a w a r d e d a $13,977,027 m o d i f i c a t i o n to a previously awarded cost-plus-award-fee c o n t r a c t for r e s t o r a t i o n of USS Stark's (FFG-31) combat system. Work will be perf o r m e d in Great Neck and is e x p e c t e d t o be c o m p l e t e d in September 1988. The Naval Sea Systems Command, Washington, D.C., is t h e c o n t r a c t i n g a c t i v i t y (N00024-83-C- 7 1 2 6 ) . Pennsylvania Shipyard Company, Chest e r , Pa., was awarded a $5,492,937 firmf i x e d - p r i c e c o n t r a c t f o r D r y d o c k i n g Planned R e s t r i c t e d Availability f o r Sustain (AFDM-7). Work will be p e r f o r m e d in Chester and is e x p e c t e d to be c o m p l e t e d February 9, 1988. The Naval Sea Systems Command, Washington, D.C., is t h e c o n t r a c t i n g a c t i v i ty ( N 0 0 0 2 4 - 8 5 - H - 8 2 0 0 ) . Mine Safety Appliances, Murrysville, Pa., was awarded a $6,829,200 o r d e r t o f u r n i sh 9 , 7 5 6 oxygen breathing apparatus units. Work will be p e r f o r m e d in Evans City, Pa.
and is e x p e c t e d t o be c o m p l e t e d in August 1988. The Navy Ships Parts C o n t r o l Center, Mechanicsburg, Pa., is t h e c o n t r a c t i n g activity ( N 0 0 1 0 4 - 8 5 - G - 0 3 6 8 ). September 25 AT&T Technologies Incorporated, G r e e n s b o r o , N.C., was a w a r d e d a $20,451,000 f i r m - f i x e d - p r i c e c o n t r a c t for o c e a n o g r a p h i c e q u i p m e n t . Work will be perf o r m e d in Burlington, N.C. (52 percent); Greensboro, N.C. ( 4 1 p e r c e n t ) ; and Whippany, N.J. (7 p e r c e n t ) and is e x p e c t e d to be c o m p l e t e d in November 1990. The Space and Naval Warfare Systems Command, Washington, D.C., is t h e c o n t r a c t i n g a c t i v i ty ( N 0 0 0 3 9 - 8 7 - C - 0 0 2 3 ) . Gould Defense Systems Incorporated, C l e v e l a n d , O h i o , was a w a r d e d a $32,491,462 f i r m - f i x e d - p r i c e c o n t r a c t for d e p o t / f a c t o r y test equipment and in-service s u p p o r t equipment for MK 4 8 t o r p e do Advanced Capability (ADCAP). Work will be p e r f o r m e d in Cleveland and is e x p e c t e d to be c o m p l e t e d in M a r c h 1992. The Naval Sea Systems Command, Washington, D.C., is t h e c o n t r a c t i n g a c t i v i t y ( N 0 0 0 2 4 - 8 7 - C - 6 4 3 7 ) . General Dynamics Corporation, Electric Boat Division, Groton, Conn., was awarded a $3,931,896 m o d i f i c a t i o n to a previously awarded cost-plus-fixed-fee c o n t r a c t for planning y a r d support f o r SSBN class operational submarines. Work will be p e r f o r m ed in G r o t o n and is e x p e c t e d t o be c o m p l e t ed September 30, 1988. The Naval Sea Syst e m s Command, Washington, D.C.. is the c o n t r a c t i n g a c t i v i t y ( N 0 0 0 2 4 - 8 6 - C - 2 0 0 3 ). Service Engineering Company, San Francisco, Calif., was awarded a $3,921,562 f i r m - f i x e d - p r i c e c o n t r a c t for repairs and alt e r a t i o n s for messing and b e r t h i n g barge APL-4. Work will be p e r f o r m e d in San Francisco and is e x p e c t e d t o be c o m p l e t e d February 24, 1988. The Naval Sea Systems Command, Washington, D.C., is the cont r a c t i n g a c t i v i t y ( N 0 0 0 2 4 - 8 5 - H - 8 7 1 7 ). Hughes Aircraft Company, Fullerton, Calif., was awarded a $16,566,477 firm-fixedp r i c e c o n t r a c t for UYQ-21 displays f o r DDG- 51 and DDG-52; LHD-2; NIPS. Work will be p e r f o r m e d in F u l l e r t o n and is e x p e c t e d t o be c o m p l e t e d in August 1991. The Naval Sea Systems Command, Washington, D.C., is t h e c o n t r a c t i n g a c t i v i t y ( N 0 0 0 2 4 - 8 7 - C - 5250). Raytheon Service Company, Virginia Beach, Va., is being a w a r d e d a $10,743,096 c o s t - p l u s - f i x e d - f e e c o n t r a c t for a new t h r e at upgrade installation kit for CG-26 class ships. Work will be p e r f o r m e d in Ventura, Calif, and is e x p e c t e d to be c o m p l e t e d in September 1988. The Naval Sea Systems Command, Washington, D.C., is t h e cont r a c t i n g a c t i v i t y ( N 0 0 0 2 4 - 8 7 - C - 2 2 8 8 ). September 29 Raytheon Company, Wayland, Mass., was awarded a $20,529,616 f i r m - f i x e d - p r i ce c o n t r a c t for MK 74 Ordnance Alterations (ORDALTS) for the Tartar Program. Work will be p e r f o r m e d in Wayland and is exp e c t e d to be c o m p l e t e d in September 1991. The Naval Sea Systems Command, Washington, D.C., is t h e c o n t r a c t i n g a c t i v i ty ( N 0 0 0 2 4 - 8 7 - C - 5 3 4 2 ) . Hughes Aircraft Company, Fullerton, Calif., was awarded a $21,638,982 modification definitizing a previously awarded firmf i x e d - p r i c e c o n t r a c t for c o m b a t c o n t r o l syst em MK 1 and fire c o n t r o l s y s t em MK 117 f o r SSN-594, 637 and 688 class submarines. Work will be p e r f o r m e d in Fullerton and is e x p e c t e d to be c o m p l e t e d in June 1990. The Naval Sea Systems Command, Washington, D.C., is t h e c o n t r a c t i n g a c t i v i ty ( N 0 0 0 2 4 - 8 7 - C - 6 0 6 4 ) . September 30 Motorola Incorporated, Scottsdale, Ariz., was awarded a $36,380,595 firm-fixedp r i c e c o n t r a c t for t h e MK 45 Mod 5 t a r g et d e t e c t i n g d e v i c e / s h r o u d assembly. Work will be p e r f o r m e d in Scottsdale and is e x p e c t e d t o be c o m p l e t e d in April 1990. The Naval Sea Systems Command, Washington. D.C., is the c o n t r a c t i n g a c t i v i t y (N00024- 87-C-5347). Portsmouth Naval Shipyard, Portsm o u t h , N.H., was t h e successful o f f e r o r in a c o m p e t i t i v e p r o g r am between public and p r i v a t e shipyards for t h e Selected Restrict e d Availabilities for SSN-706 and SSN-690. The value of this effort is $11,416,336. Work will be p e r f o r m e d in Groton, Conn, and is e x p e c t e d t o be c o m p l e t e d November 1, 1988. The Naval Sea Systems Command, Washington, D.C., is t h e r e q u i r i n g a c t i v i ty Textron Marine Systems, New Orleans, La., was awarded a $9,900,000 cost-plusfixed- fee c o n t r a c t for c o n t r a c t o r interim support services for t h e Landing Craft Air Cushion (LCAC) Program. Work will be perf o r m e d in Panama City, Fla. and is e x p e c t ed t o be c o m p l e t e d March 31, 1988. The Naval Sea Systems Command, Washington, D.C., is the c o n t r a c t i n g a c t i v i t y (N00024-87-C- 2263). Sperry Corporation, St. Paul, Minn., was awarded a $29,692,754 m o d i f i c a t i o n definitizing a previously awarded f i r m - f i x e d - p r i ce c o n t r a c t f o r t h e A N / U S Q - 6 9 ( V ) data t e r m i - nal set and O L - 2 6 7 ( V ) / U Y K data terminal g r o u p f o r various ships i n c l u d i n g LHD-2, CG- 64, CG-65, CG-66, CG-67, CG-68, BB-64, CVN-73, FFG-31, DDG-52, DDG-53 and DDG-54. Work will be p e r f o r m e d in Clearw a t e r , Fla. and is e x p e c t e d t o be c o m p l e t ed in June 1989. This c o n t r a c t combines purchases for t h e U.S. Navy (99 p e r c e n t ) and Spain (1 p e r c e n t ) under t h e Foreign Military Sales Program. The Naval Sea Systems Command, Washington, D.C., is t h e cont r a c t i n g a c t i v i t y ( N 0 0 0 2 4 - 8 6 - C - 5 2 8 8 ). Hughes Aircraft Company, Fullerton, Calif., was awarded a $28,937,000 f i x e d - p r i ce c o n t r a c t for A N / U Y A - 4 display equipment for various U.S. and Australian ships. Work will be p e r f o r m e d in Fullerton and is exp e c t e d to be c o m p l e t e d December 30, 1989. This c o n t r a c t c o m b i n e s purchases for t h e U.S. Navy ( 9 9 . 3 p e r c e n t ) and Australia (.7 p e r c e n t ) under t h e Foreign M i l i t a r y Sales p r o g r a m . The Naval Sea Systems Command, Washington, D.C., is t h e c o n t r a c t i ng a c t i v i t y ( N 0 0 0 2 4 - 8 7 - C - 5 2 6 0 ). Bell Aerospace Textron, Wheatfield, N.Y., was awarded a $9,308,346 c o n t r a c t t o definitize a previously awarded letter contract for t h r e e A N / S P N - 4 6 ( V) Automatic Carrier Landing Systems for shipboard use. Work will be p e r f o r m e d in Niagara Falls, N.Y. and is expected to be completed in August 1988. The Space and Naval Warfare Systems Command, Washington, D.C., is the c o n t r a c t i n g activity (N00039-86-C-0126). October 1 General Electric Company, Syracuse, N.Y., was awarded a $81,575,261 fixedprice c o n t r a c t for supplies and services for AN/SQS-53C sonar ranging-detecting sets. Work will be p e r f o r m e d in Syracuse and is expected t o be c o m p l e t e d in July 1991. The Naval Sea Systems Command, Washington, D C., is t h e c o n t r a c t i n g activity (N00024- 85-C-6116). International Business Machines Corporation, Federal Systems Division, Manasas, Va., was awarded a $31,441,056 long lead letter contract for detailed design, engineering and s o f t w a r e tasks for t h e AN/BSY- 1(V) Team Trainer (TT) and the Weapons L a u n c h S y s t e m O p e r a t i o n a l T r a i n er (WLSOT). Work will be p e r f o r m e d in Manassas and is expected t o be c o m p l e t e d in January 1988. The Naval Sea Systems Command, Washington, D.C., is t h e c o n t r a c t i ng activity (N00024-87-C-6078). International Business Machines Corporation, Federal Systems Division, Manasas, Va., was awarded a $68,200,000 modificat i o n t o a previously awarded firm-fixed-price c o n t r a c t for BQQ-5 sonar conversion kits for SSN-594, 637 and 688 class submarines. Work will be p e r f o r m e d in Manassas, Va. (69 percent) and Owego, N.Y. ( 3 1 perc e n t ) and is expected to be c o m p l e t e d in June 1990. The Naval Sea Systems Command, Washington, D.C., is t h e c o n t r a c t i ng activity (N00024-87-C-6025). Rockwell International, Anaheim, Calif., was awarded a $10,210,000 m o d i f i c a t i o n to a previously awarded fixed-price-incentive c o n t r a c t for long lead materials and labor for AN/USQ-82(V) data multiplex systems. Work will be p e r f o r m e d in Anaheim and is expected to be completed in February 1988. The Naval Sea Systems Command, Washington, D.C., is t h e c o n t r a c t i n g activity (N00024-85-C-7130). Tacoma Boatbuilding Company, Tacoma, Wash., was awarded a $18,590,001 firm-fixed-price c o n t r a c t for c o n s t r u c t i o n of two Ocean Surveillance Ships (T-AGOS 11 and 12). Work will be p e r f o r m e d in Tacoma and is e x p e c t e d t o be c o m p l e t e d October 1, 1989. The Naval Sea Systems Command, Washington, D.C., is t h e c o n t r a c t i n g activity (N00024-87-C-2045). October 2 United Technologies Corporation, Hamilton Standard Division, Windsor Locks, Conn., was awarded a $50,000,000 letter c o n t r a c t for materials for submarines. Work will be p e r f o r m e d in Windsor Locks and is expected to be completed in March 1992. The Naval Sea Systems Command, Washington, D.C., is the c o n t r a c t i n g activity (N00024-87-C-4581). Raytheon Corporation, Wayland, Mass., was awarded a $35,163,292 firm-fixedprice contract for AN/SPS-49 radars for CG's and Aegis ships. Work will be perf o r m e d in Wayland and is expected t o be c o m p l e t e d in November 1990. The Naval Sea Systems Command, Washington, D.C., is the c o n t r a c t i n g activity (N00024-87-C- 5236). Admiral Towing and Barge Corporation of Ohio, Cleveland, Ohio, was awarded a $5,461,232 f i r m - f i x e d - p r i c e contract for harbor service for Pensacola, Fa. Service will be performed utilizing four U.S.-flag tugs: Michigan, New Mexico, Maryland and Tennessee. The c o n t r a c t p e r f o r m a n c e is 15 months with three additional 12 month options. The Military Sealift Command, Washington, D.C., is t h e c o n t r a c t i n g activity (N00033-88-C-1200). October 5 Ingalls Shipbuilding Incorporated, Pascagoula, Miss., was awarded a $57,768,446 m o d i f i c a t i o n t o a previously awarded costplus- award-fee letter contract for class standard equipment for CG-47 class cruisers. Work will be p e r f o r m e d in Pascagoula and is expected t o be c o m p l e t e d in January 1992. The Naval Sea Systems Command, Washington, D.C., is t h e c o n t r a c t i n g activity (N00024-87-C-2165). October 6 Analysis and Technology Incorporated, Arlington, Va., was awarded a $14,822,176 cost-plus-fixed-fee contract for technical services for Undersea Warfare Operating guidelines. Work will be p e r f o r m e d in Arlingt o n and is expected to be c o m p l e t e d September 30, 1991. The Naval Sea Systems Command. Washington, D.C., is the cont r a c t i n g activity (N00024-87-C-6022). October 7 Gould Defense Systems Incorporated, C l e v e l a n d , O h i o , was a w a r d e d a $54,788,848 modification to a previously awarded fixed-price-incentive c o n t r a c t for pilot production for MK 48 torpedo Advanced Capability (ADCAP). Work will be p e r f o r m e d in Cleveland and is expected to be c o m p l e t e d in December 1992. The Naval Sea Systems Command, Washington, D.C., is the c o n t r a c t i n g activity (N00024-86-C- 6162). Rockwell International Corporation, Anah e im Calif., was awarded a $34,373,737 m o d i f i c a t i o n t o a previously awarded cont r a c t for 2 1 electrically suspended gyronavig a t o r s plus support. Work will be p e r f o r m ed in Anaheim ( 8 5 percent) and El Paso, Texas ( 1 5 percent) and is expected to be completed in November 1989. The Naval Sea Systems Command, Washington, D.C., is t h e c o n t r a c t i n g a c t i v i t y (N00024-86-C- 4095). October 14 Rockwell-Marconi JVT, Richardson, Texas, was awarded a $14,017,000 firm-fixedprice c o n t r a c t for the full scale engineering development of the High Frequency, Anti- J am communications system and Link 11 improvements for ship, submarine, shore and air use. Work will be p e r f o r m e d in Richardson, Texas ( 4 0 percent); Cedar Rapids, Iowa ( 3 0 percent); and Chelmesford, England (30 percent), and is expected to be c o m p l e t e d in December 1988. The Space and Naval Warfare Systems Command, Washington, D.C., is t h e c o n t r a c t i n g activity (N00039-87-C-0282). October 16 Newport News Shipbuilding and Dry Dock Company, Newport News, Va., was awarded a $5,444,224 modification to a p r e v i o u s l y awarded f i x e d - p r i c e - i n c e n t i ve c o n t r a c t for surface ship support barge a l t e r a t i on work. Work will be p e r f o r m e d in Newport News and is expected t o be completed by July 14, 1989. The Naval Sea Systems Command, Washington, D.C., is the c o n t r a c t i n g activity (N00024-86-C-2078). Arowel Corporation, San Diego, Calif., was awarded a $3,318,868 f i r m - f i x e d - p r i ce c o n t r a c t f o r Selected R e s t r i c t e d Availability (SRA) f o r USS C o n s t e l l a t i o n (CV-64). Work will be p e r f o r m e d in San Diego and is e x p e c t e d to be c o m p l e t e d February 28, 1988. The Supervisor of Shipbuilding, Conv e r s i o n and Repair, San Diego, Calif., is t he c o n t r a c t i n g a c t i v i t y ( N 0 0 0 2 4 - 8 5 - H - 8 1 0 7 ). October 20 Atlantic Dry Dock Corporation, Fort G e o r g e Island, Fla., was a w a r d e d a $6,950,000 f i r m - f i x e d - p r i c e c o n t r a c t f o r t he D r y d o c k i n g Selected R e s t r i c t e d Availability (DSRA) for USS Aubrey Fitch (FFG-34). Work will be p e r f o r m e d in Fort George Island and is e x p e c t e d to be completed March 15, 1988. The Naval Sea Systems Command, Washington, D.C., is t h e cont r a c t i n g a c t i v i t y ( N 0 0 0 2 4 - 8 5 - H - 8 1 1 1 ). Southwest Marine Incorporated, Terminal Island, Calif., was awarded a $6,749,238 m o d i f i c a t i o n to a previously awarded firmf i x e d - p r i c e c o n t r a c t for D r y d o c k i n g Selected R e s t r i c t e d Availability (DSRA) for USS Ogden (LPD-5). Work will be p e r f o r m e d in Terminal Island. The Supervisor of Shipb u i l d i n g , C o n v e r s i o n and Repair, Long Beach, Calif., is the c o n t r a c t i n g activity ( N 0 0 0 2 4 - 8 5 - H - 8 2 2 2 ) . VSE Corporation, Alexandria, Va., was awarded a $3,605,275 cost-plus-firm-fixedfee c o n t r a c t for vehicle design support of t h e Assault Amphibious Vehicle (AAV-7A1). Work will be p e r f o r m e d in Alexandria and is e x p e c t e d to be c o m p l e t e d October 22, 1992. The Naval Sea Systems Command, Washington, D.C., is t h e c o n t r a c t i n g a c t i v i ty ( N 0 0 0 2 4 - 8 8 - C - 2 0 3 7 ) . October 21 Bender Shipbuilding and Repair Company Incorporated, Mobile, Ala., was awarded a $6,428,920 f i r m - f i x e d - p r i c e c o n t r a c t for t h e d r y d o c k i n g and overhaul of USNS Sirius, a Military Sealift Command combat stores ship. Work will be p e r f o r m e d in Mobile. The Military Sealift Command, Atlantic, is the c o n t r a c t i n g a c t i v i t y ( N 6 2 3 8 1 - 8 8 - C - 0 2 0 0 ). November 2 Ingalls Shipbuilding Inc., Pascagoula, Miss., was awarded a $28,700,000 modific a t i o n to a previously awarded cost-plusa w a r d - f e e c o n t r a c t for the p r o d u c t i on phase of t h e r e s t o r a t i o n of t h e USS Stark (FFG-31). The w o r k is e x p e c t e d t o be comp l e t e d August 31, 1988. The Naval Sea Syst e m s Command, Washington, D.C., is the c o n t r a c t i n g a c t i v i t y ( N 0 0 0 2 4 - 8 7 - C - 8 5 2 2 ). November 4 Westinghouse Electric Corporation, Bettis Atomic Power Laboratory, Wilkins Township, Pa., was awarded a $194,400,000 m o d i f i c a t i o n t o a previously awarded costplus- fixed-fee c o n t r a c t for naval nuclear p r o p u l s i o n r e s e a r c h and d e v e l o p m e n t . The w o r k is e x p e c t e d t o be c o m p l e t e d in Sept e m b e r 1988. NAVSEA is t h e c o n t r a c t i ng a c t i v i t y ( N 0 0 0 2 4 - 7 9 - C - 4 0 2 7 ). General Electric Company, Knolls Atomic Power Laboratory, S c h e n e c t a d y , N.Y., was awarded a $114,600,000 m o d i f i c a t i o n t o a previously awarded cost-plus-fixed-fee cont r a c t for naval nuclear p r o p u l s i o n research and d e v e l o p m e n t . The w o r k is e x p e c t e d to be c o m p l e t e d in September 1988. NAVSEA is t h e c o n t r a c t i n g a c t i v i t y (N00024-79-C- 4 0 2 7 ) . November 5 General Dynamics, Electric Boat Division, G r o t o n , Conn., was a w a r d e d a $102,300,000 m o d i f i c a t i o n t o a previously awarded cost-plus-fixed-fee c o n t r a c t for s t e am and e l e c t r i c plant development for t h e Seawolf (SSN-21). T h e w o r k is e x p e c t ed t o be c o m p l e t e d November 30, 1994. NAVSEA is t h e c o n t r a c t i n g a c t i v i t y ( N 0 0 0 2 4 - 8 7 - C-4086). Newport News Shipbuilding and Dry Dock Co., N e w p o r t News, Va., was awarded a $7-million f i r m - f i x e d - p r i c e c o n t r a c t for Selected Restricted Availability (SRA) for USS Pittsburgh (SSN-720). Work is exp e c t e d t o be c o m p l e t e d in July 1988. The c o n t r a c t was a w a r d e d by t h e Naval Sea Syst e m s Command, Washington (N00024-88- C-2022). Noverfiber 6 Norfolk Shipbuilding and Drydock Corp., N o r f o l k , Va., was awarded a $3.4-million f i r m - f i x e d - p r i c e c o n t r a c t f o r D r y d o c k i n g Sel e c t e d Restricted Availability (DSRA) for USS Fulton (AS-11). Work is e x p e c t e d t o be c o m p l e t e d in M a r c h 1988. The c o n t r a c t was awarded by t h e Supervisor of Shipbuilding, C o n v e r s i o n and Repair, Groton, Conn.
( N 0 0 0 2 4 - 8 5 - H - 8 1 9 5 ) . November 13 Newport News Shipbuilding and Dry Dock Co., N e w p o r t News, Va., was awarded a $34.3-million m o d i f i c a t i o n t o a previously awarded cost-plus-fixed-fee c o n t r a c t f o r t he Complex Overhaul of USS E n t e r p r i s e (CVN- 65). Work is e x p e c t e d to be c o m p l e t e d in September 1988. The c o n t r a c t was awarded by t h e Naval Sea Systems Command, Washington ( N 0 0 0 2 4 - 8 6 - C - 2 0 7 8 ). Newport News Shipbuilding and Dry Dock Co., Newport News, Va., was awarded a $3.1-million m o d i f i c a t i o n t o a previously awarded cost-plus-fixed-fee c o n t r a c t for planning y a r d services f o r nuclear powered submarines. Work is e x p e c t e d to be comp l e t e d in September 1988. The c o n t r a ct was awarded by the Naval Sea Systems C o m m a n d , W a s h i n g t o n ( N 0 0 0 2 4 - 8 5 - C - 4020V November 18 General Dynamics Corp., Electric Boat Division, G r o t o n , Conn., is being a w a r d e d a $17.5-million cost-plus-fixed-fee contract f o r e n g i n e e r i n g services f o r t h e SSN-21 Seawolf class submarine. Work is e x p e c t e d to be c o m p l e t e d Sept. 30, 1988. The c o n t r a ct was awarded by the Naval Sea Systems C o m m a n d , W a s h i n g t o n ( N 0 0 0 2 4 - 8 7 - C - 2011). November 20 Ocean Systems Engineering Inc., Houston, is being awarded a $3 million firmf i x e d - p r i c e - c o n t r a c t t o m a n u f a c t u r e one unmanned t e t h e r e d w o r k submersible for cable o p e r a t i o n . Work is e x p e c t e d t o be comp l e t e d in 1988. The c o n t r a c t was awarded by the Naval Supply Center, Norfolk, Va.
( N 0 0 1 8 9 - 8 8 - C - 0 0 6 9 ) . Continental Maritime, San Francisco, Calif., is being awarded a $10 million f i r m - f i x e d - p r i c e c o n t r a c t with p e r f o r m a n c e inc e n t i v e for D r y d o c k i n g Phased Maintenance Availability for USS Mars (AFS-1). Work is e x p e c t e d to be c o m p l e t e d May 10, 1988. The c o n t r a c t was awarded by t h e Naval Sea Systems Command, Washington (N00024- 85-H-8218). Boston Whaler Inc., Rockland, Mass., is being awarded a $4.8 million l e t t e r cont r a c t for 122 rigid raiding craft. Work is e x p e c t e d to be c o m p l e t e d in September 1988. The c o n t r a c t was awarded by the U.S. Marine Corps, Washington (M00027- 88-C-0015). November 24 AT&T Technologies, Greensboro, N.C., is being awarded a $15 million cost-plusfixed- fee c o n t r a c t for oceanographic research and engineering. Work is e x p e c t e d to be c o m p l e t e d Sept. 30, 1988. The c o n t r a ct was awarded by the Space and Naval Warfare Systems Command, Washington ( N 0 0 0 3 9 - 8 8 - C - 0 0 6 9 ) . December 2 Rockwell International, Anaheim, Calif., was awarded a $8,475,391 cost-plus-fixedfee c o n t r a c t for m a i n t e n a n c e and repair of n a v i g a t i o n subsystems for t h e T r i d e n t Missile Program. Work will be p e r f o r m e d in Anaheim, California, and is e x p e c t e d t o be comp l e t e d June 30, 1990. The Strategic Syst e m s P r o g r am Office, Washington, D.C., is t h e c o n t r a c t i n g a c t i v i t y ( N 0 0 0 3 0 - 8 8 - C - 0 0 4 4 ) . December 8 ANADAC Incorporated, Arlington, Va., was awarded a $9,434,936 cost-plus-fixedfee c o n t r a c t f o r p r o g r am management supp o r t services f o r t h e A N / B S Y - 1 Submarine Combat System. Work will be p e r f o r m e d in A r l i n g t o n and is e x p e c t e d t o be c o m p l e t ed September 30, 1991. The Naval Sea Syst e m s Command, Washington, D.C., is the c o n t r a c t i n g a c t i v i t y ( N 0 0 0 2 4 - 8 8 - C - 6 0 9 0 ). EG&G Washington Analytical Services Center Incorporated, Rockville, Md., was awarded a $22,477,739 cost-plus-fixed-fee c o n t r a c t for system engineering and int e g r a t e d logistic support services for the A N / B S Y - 1 Submarine Combat System. Work will be p e r f o r m e d in A r l i n g t o n and is e x p e c t e d to be c o m p l e t e d September 30, 1991. The Naval Sea Systems Command, Washington, D.C., is t h e c o n t r a c t i n g a c t i v i ty ( N 0 0 0 2 4 - 8 8 - C - 6 0 8 9 ) . General Electric Company, Pittsfield, Mass., was issued a $42,767,493 modificat i o n to a previously awarded cost-plusi n c e n t i v e - f e e c o n t r a c t for design, development and p r o d u c t i o n of fire c o n t r o l systems for t h e T r i d e n t Missile Programs. Work will be p e r f o r m e d in Pittsfield and is e x p e c t e d to be c o m p l e t e d December 31, 1989. The S t r a t e g i c Systems P r o g r am Office, Washington, D.C., is the c o n t r a c t i n g activity ( N 0 0 0 3 0 - 8 4 - C - 0 0 2 2 ) . December 10 Norfolk Naval Shipyard, P o r t s m o u t h, Va., is t h e successful offeror in a c o m p e t i - tive p r o g r am between public and private s e c t o r shipyards for t h e Selected Restrict e d Availability (SRA) of USS Baton Rouge (SSN-689). Norfolk Naval Shipyard was assigned t h e SRA on a f i r m - f i x e d - p r i c e basis. The p r i c e f o r this e f f o r t is $5,462,494. Work will be p e r f o r m e d in Norfolk, Va., and is e x p e c t e d to be c o m p l e t e d October 12, 1988. The Naval Sea Systems Command, Washington, D.C., is t h e r e q u i r i n g a c t i v i t y.
December 16 The Singer Company, Little Falls, N.J., was a w a r d e d a $11,413,416 cost-plus-fixedfee c o n t r a c t f o r e n g i n e e r i n g services f o r t he T r i d e n t Missile Program. Work will be perf o r m e d in Wayne, N.J., and is e x p e c t e d to be c o m p l e t e d September 30, 1988. The S t r a t e g i c Systems Program Office, Washington, D.C., is the c o n t r a c t i n g activity ( N 0 0 0 3 0 - 8 8 - C - 0 0 0 8 ) . December 17 Westinghouse Electric Corp., M a r i n e Division, Sunnyvale, Calif., received a $58- million c o n t r a c t f o r main p r o p u l s i o n complexes for SSN-688 class submarines. Work is e x p e c t e d t o be c o m p l e t e d in Sept e m b e r 1990. The c o n t r a c t was awarded by the Naval Sea Systems Command, Washington ( N 0 0 0 2 4 - 8 8 - C - 4 1 8 1 ). December 18 Newport News Shipbuilding and Dry Dock Co., Newport News, Va., received a $38-million c o n t r a c t for post availability for USS Key West (SSN 722). Work is e x p e c t e d to be c o m p l e t e d in December 1988. The c o n t r a c t was awarded by the Supervisor of Shipbuilding, Conversion and Repair, Virginia ( N 0 0 0 2 4 - 8 6 - H - 8 0 0 2 ). General Electric Co., Government Electronics Systems Division, Syracuse, N.Y., received a $99.8-million c o n t r a c t f o r A N / SQR-19 Sonar for DDG and CG ships. Work is expected to be c o m p l e t e d July 31, 1991. The c o n t r a c t was awarded by the Naval Sea Systems Command, Washingt o n ( N 0 0 0 2 4 - 8 5 - C - 6 0 1 2 ). Monark Boat Co., M o n t i c e l l o , Ark., received a $3.6-million c o n t r a c t for t h e cons t r u c t i o n of t e n 4 1 - f o o t Patrol Boats. Work is expected to be c o m p l e t e d in March 1989. The c o n t r a c t was awarded by the Naval Sea Systems Command (N00024- 88-C-2072). December 23 Raytheon Co., Wayland, Mass., received a $3-million c o n t r a c t for t h e r e l o c a t a b le o v e r - t h e - h o r i z o n Radar s y s t em for shore use. Work is e x p e c t e d t o be c o m p l e t e d by July 31, 1988. The c o n t r a c t was awarded by t h e Space and Naval Warfare Systems Command, Washington, D.C. ( N 0 0 0 3 9 - 8 4 - C-0049). Lockheed Missiles and Space Co. Inc., Sunnyvale, Calif., received a $240.9-million c o n t r a c t for development and prod u c t i o n of T r i d e n t II (D-5) missiles f o r the T r i d e n t missile p r o g r a m . Work is e x p e c t ed t o be c o m p l e t e d in M a r c h 1990. The cont r a c t was awarded by t h e S t r a t e g i c Syst e m s Program Office, Washington, D.C.
( N 0 0 0 3 0 - 8 4 - C - 0 1 0 0 ) . AT&T Technologies, Greensboro, N.C., r e c e i v e d a $10.6-million c o n t r a c t for o c e a n o g r a p h i c research. Work is exp e c t e d t o be c o m p l e t e d by June 30, 1989. The c o n t r a c t was awarded by t h e Space and Naval Warfare Systems Command, Washington ( N 0 0 0 3 9 - 8 8 - C - 0 1 1 5 ). Norfolk Shipbuilding and Drydock Corp., Norfolk, Va., received a $4.8-million c o n t r a c t for d r y d o c k i n g selected res t r i c t e d availability f o r USS Vulcan (AR-5). Work is e x p e c t e d t o be c o m p l e t e d by May 7, 1988. The c o n t r a c t was awarded by t he Naval Sea Systems Command, Washingt o n ( N 0 0 0 2 4 - 8 5 - H - 8 1 9 5 ).